At age 27, Vanessa Alaumary has already had several cosmetic procedures. She started getting injectables a few years ago and says many of her friends also started in their early 20’s. “All of my friends are in their 20’s and they all do it,” Alaumary said. The 27-year-old says it’s very easy now to access information online about which procedures are available to younger people as well as to research various clinics around the city. Alaumary is not alone. CBC Toronto called various clinics around the city and many say they are seeing an increasing number of clients in their early-to-mid 20s. She also started treatments in her mid 20’s. She believes getting botox and dermal fillers is becoming more accepted — and thinks it’s important to be open about it so that people don’t always take what they see online as reality. “You cut your hair and you feel better about yourself. You get a new pair of jeans and you feel better about yourself. It’s just another thing you can do to feel better about yourself,” Lao said. Lao adds that clinics seem to be advertising in a way that is more appealing to young people by posting before and after photos and using social media. Facial plastic surgeon Dr. Cory Torgerson in Yorkville has a large following on Instagram as well as Youtube. His website includes a section about preventative botox for millennials. “We’re seeing a lot more people in their early-to-mid-20’s not just for surgical things but maintenance prevention things,” Torgerson said. Torgerson says the younger clientele is a big growing part of the industry, and he works with his clients to make sure the procedures they want can be done in a way that looks natural and works for them. “There are things that people are self-conscious about, and now there are non-surgical procedures,” he said, noting he sees an increase in some of the clients’ confidence afterwards. Dermal fillers, botox and laser treatments are the popular non-surgical procedures among Torgerson’s younger clients. 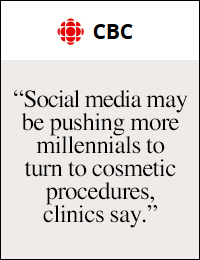 The doctor admits that social media likely plays a role in the increase in younger clients. He says the social icons online seem to be a powerful force in influencing the younger generation. Dr. Stephanie Cassin, who works in the department of psychology at Ryerson University, says the rise in image-based social media could be contributing to millennials feeling pressured to look a certain way. “Being bombarded with a lot of idealized images of what the ideal appearance is, and constantly seeing that in a social media feed, over time you start to think that’s just what everybody looks like,” Cassin said. Cassin adds that using filters on apps also contributes to the idea of trying to achieve perfection. And Cassin says perhaps the filters could eventually lead to fillers. Dr. Lisa Kellett, a dermatologist at DLK on Avenue, a cosmetic dermatology and laser clinic located on Avenue Road near Davenport Road in downtown Toronto, says botox is a pediatric drug for therapeutic use for conditions such as cerebral palsy. Kellett said the most common side effects when injected are swelling and bruising but there aren’t any known long- term dangers. “If you see someone like a plastic surgeon or a dermatologist our products will tend to be safer,” she said.